This is a really nice site with great potential up in the West Midlands…. 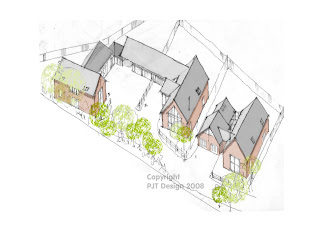 We have been working with the developers and planners to come up with the following scheme. It’s going to be red brick, slate roofs and a combination of oak framing and cream coloured joinery. The design concept for the site was to create random irregular built form reminiscent of farmyard renovations as the site lies on the edge of agricultural land…. Should look very nice when done…..